On the rainy, blustery days that fill December and January here in Oregon there is one thing that Works for Me on a little 2 year old with cabin fever…the trampoline. We have a small garage, we can fit the car into it but it’s a pain to get out of the car once it’s in there. Plus we lost the remote to the garage door, so we just don’t use it. 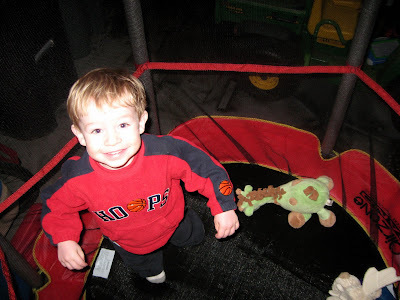 Until we got this trampoline for Zane’s birthday. Now when I just can’t stand Zane making another running lap around the kitchen bar I send him to the garage to burn his energy on the trampoline. One reason I know this is a good idea is that my neighbor came over with her 4 year old and when she saw it she ran out and bought one to put in her garage also. We also have a huge power wheels in the garage, that doesn’t work. That Zane loves to play on when he gets bored of jumping. We have also considered putting a swing in the garage also. The trampoline is really cute and so is the little guy!